I was feeling really frustrated and desperate because of my overweight at 135 kg / 297.62 lbs and thinking this could lead me to many health conditions, and that if I didn’t do anything to change then the consequences would be severe. Coming home from work, I would only want to lay down, I was always in a bad mood, and my knees would hurt because of the weight. 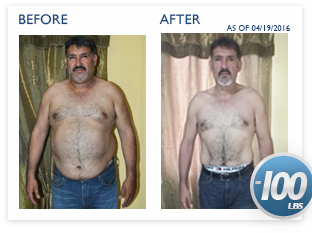 I had tried to lose weight without any favorable results. I was like in an abyss, depressed. If they called me chubby, I wondered if it was affectionately or because of how I looked. Today, my wife keeps calling me chubby, and today I can see it was affectionately. Another one of my motivations is my son, how could I ask him to lose weight if I was worse? For him, not attending a physical education class at school was common since running was a nightmare for him. One day, I met with the son of a great friend of mine who told me about the YOR Health products. He told me this would help me lose weight and it was then that I made the decision to start the 8-Week YOR Best Body Challenge in February 2015. I started taking the YOR Probiotics Ultra in the morning on an empty stomach. At breakfast, I had a chocolate YOR MRP with YOR Fiber Plus, one apple and water. At noon, I had a Greek natural yogurt with banana or strawberries. Before lunch I had a YOR Digest Ultra capsule and my meal which could be chicken, beef, veggie salad. In the afternoon I had an orange or grapefruit juice as a snack. For dinner, I had a vanilla YOR MRP with strawberries or banana. 2 months after taking the YOR Health products I started going to the gym, since at that period I had lost 55 lbs / 24.95 kg and became a champion for that Challenge group. I exercise for 2 hours a day, doing 60 minutes of cardio on the treadmill (30 min) and on the elliptical machine (30 min). I also do one hour of abs at the machines and I have a YOR Berry Blast to energize myself. To get my vitamins I take 6 YOR Essential Vitamin tablets a day and I exercise from Monday to Saturday. I currently weigh 89.6 kg / 197.53 lbs and I’ve managed to build a healthy lifestyle and meet the goal of losing 100 pounds I had set, in a period of one year and one month. I reached my goal in March, 2016 having excellent health and quality of life. I currently run 10 km at the beach when I used to think I would never be able to do it, and I’ve motivated my son to exercise and now he goes to the gym with me. I’ve reached the goals that were the reason I joined the YOR Health 8-Week Challenge: to be able to lose weight, both of us, and to have an excellent quality of life.